Fishermen on southern Alberta’s Castle River have discovered fossils the Royal Tyrrell Museum is calling a potential new dinosaur species. Fishermen on southern Alberta’s Castle River have discovered what authorities at the Royal Tyrrell Museum are calling a potential new species of dinosaur. Watch the fossil extraction in the Castle River in the video below. On mobile? Click here. Scientists believe the specimen belongs to a new species of hadrosaur (duck-billed dinosaur) that would have roamed Alberta up to 80 million years ago. "This specimen is coming from a place where we haven't had dinosaurs before — it's the extreme southwest of the province. So I think this will be a significant specimen. We're going to learn a lot from it," said Royal Tyrrell Museum dinosaur curator Donald Henderson. The discovery was reported to the museum and a 1,133-kilogram fossil block containing a partial dinosaur skull, neck and chest was airlifted out of the discovery site and carefully transported to the Royal Tyrrell Museum. Paleontology staff say the skull is intact, which is surprising as fossils are typically found crushed and flattened. The bones will be researched over the next year. 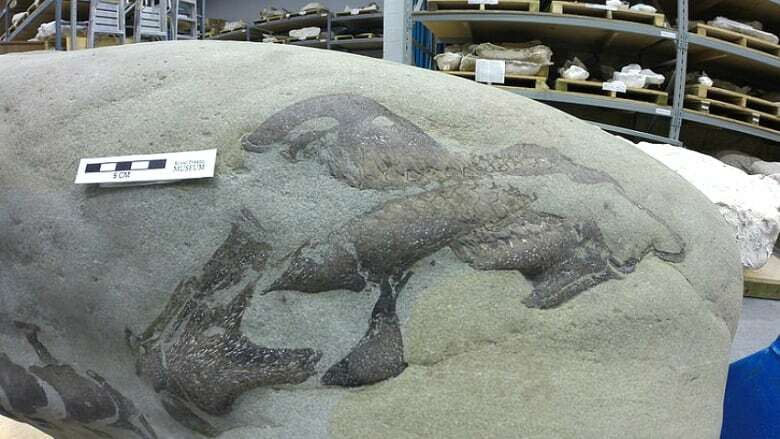 It is believed that the fossil was dislodged by flooding in 2013 and marks an entirely new area to search for evidence of dinosaurs in southern Alberta. Royal Tyrrell Museum staff ask that all fossil discoveries made by the public be reported to them so they can be properly researched and preserved.